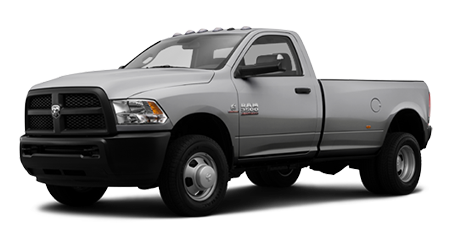 When you need a pickup truck with capabilities more like that of a big rig, the 2015 Ram 3500 is the choice for you. Sulphur Springs Chrysler Dodge Jeep Ram sells cars trucks and Jeeps to Tyler, Greenville, and Sulphur Springs residents, and we treat everyone like they are a big deal. The heavy duty 2015 Ram 3500 comes with your choice of two gas-powered Hemi V8s or the commercial-grade Cummings 6.7-liter turbodiesel inline-six. Two- or four-wheel drivetrains are available, as is a dual-wheel rear axle. Transmissions include a six-speed automatic, a heavier duty six-speed auto, and a six-speed manual. A base V8 Ram 3500 can tow over 13,000 pounds with ease, the 6.4 Hemi can tow over 16,000 pounds, and the diesel-powered truck with proper options is good for up to 30,000 pounds. Ram 3500 trucks come in Regular Cab, Crew Cab and Mega Cab body styles. Trims include Tradesman, SLT and Laramie, with SLT Lone Star and Laramie Longhorn and Laramie Limited special packages. The workhorse of the family is the Tradesman, but it is still equipped with great features like AC, cruise control, tilt steering, a limited slip differential, and 6 speaker stereo with iPod, USB, and auxiliary inputs. Crew cab versions get power windows and locks too. The 3500 SLT trim includes power windows and locks, a sliding rear window (power on four-door cabs), keyless entry, integrated trailer brake, chrome trim, and a 5" touchscreen-controlled infotainment system with smartphone connectivity. The Lone Star (Crew and Mega Cab only) comes with more chrome and Lone Star badging, plus 18" alloy wheels (SRW models), fog lights, a 110-volt outlet, and 10-way power driver's seat. Crew and Mega Cab models top out at the Laramie trim with heated leather seats, a rearview camera, and parking sensors, and a ten-speaker upgraded entertainment system. Laramie Longhorn and Laramie Limited add even more options and trim on top of these already loaded trucks. Many options can be added individually to trucks without the upgraded trim and option packages. When you need a Texas-sized truck with the ability to tow and haul almost anything, you need the 2015 Ram 3500. Find one today at Sulphur Springs CDJR, serving Tyler and Greenville, TX.